CIS keeps track of all the changes made to its configuration since its installation. 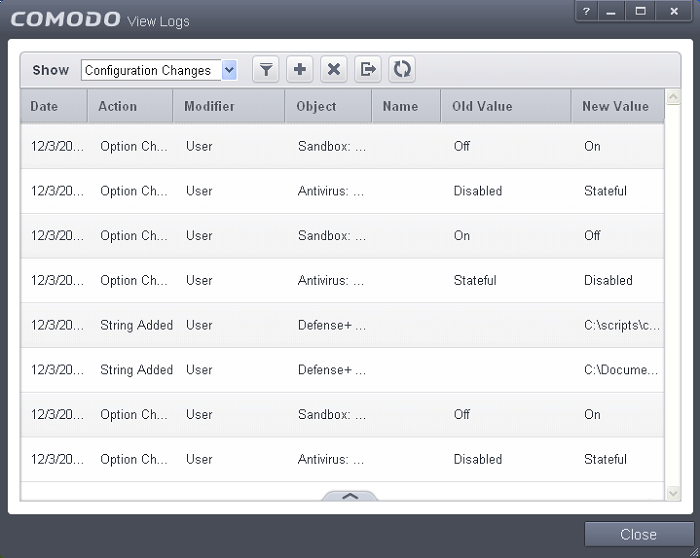 The 'Configuration Changes' log viewer displays a list of changes to various options and other configuration changes made to the application. The 'Configuration Changes' logs can be viewed by selecting 'Configuration Changes' from the 'Show' drop-down of the log viewer interface. Date - Contains precise details of the date and time of the configuration change. Action - Indicates the nature of the configuration change. Modifier - Indicates the user that has made the configuration change. Object - Indicates the CIS object that was affected by the configuration change. Name - Indicates the parameter changed. Old value - Indicates the value of the parameter before the configuration change. New value - Indicates the value of the parameter after the configuration change. To export the Configuration Changes logs as a HTML file click the 'Export' button . To refresh the Configuration Changes logs, click the 'Refresh' button . To clear the Configuration Changes logs click the 'Clear' button .